The 3490 performs brilliantly and costs less than many of AVM's previous routers, while still offering the same great software. That makes it a winner, in our book. The new mainstream Fritz!Box 3490 offers the guts of the company's top-end 7490 router, including 3x3 MIMO 802.11ac wireless, but without the built-in hardware to manage DECT or analogue telephony, which brings down the unit's cost considerably. It costs around £130 (US$157, AU$192), considerably less than many top-end 802.11ac routers. The 3490 has a built-in a modem that supports ADSL and VDSL with the same vectoring technology that allows for faster fibre connections. Of course, as with just about any other router, it works fine with cable connections too. There are two USB 3.0 ports, one at the side and one at the rear, with four gigabit ethernet ports at the back, along with a DSL connector. Sitting next to the 7490, it would be impossible to tell the two apart, since both sport a red and silver chassis, and internal antennas with fins on the top to boost the signal. Aside from the lack of special DECT hardware, the 3490 is similar on the inside too. It has the same 800MHz dual-core processor and comes with 128MB of memory. But as with any AVM router, the real selling point is the Fritz!OS software, which is intuitive, well-designed, and offers features that aren't offered by competitors. The 3490 comes with the newly-updated Fritz!OS 6.20, which adds even more to an already strong feature set. There's a new security interface and secure password suggestion. And new since at least the version of Fritz!OS that shipped with the 7490, is the use of QR codes to quickly scan all the router settings with a mobile phone, if you're running into issues connecting your devices. The software offers other useful features, such as a frequency scanner, which can tell you which 2.4GHz or 5GHz wireless channels are currently in use by other nearby routers, a diagnostics mode and a file management system for connected USB devices. The "info" LED at the front can be configured to turn on when a specific event occurs, such as a USB device being connected. Finding the right setting to adjust, meanwhile, always feels a lot easier than with other models, as though a bit more thought has gone into it than many networking firms bother with, a sure sign of good UI design. AVM has also worked on its energy-saving credentials too, a concern for many people, since routers are usually left on all the time. As always, the ethernet ports are set to run at only 100Mbit/sec when you first set up the router. Look in the logs and you can see the router automatically cuts power to its antennas when all connected devices are idle. You can schedule the wireless to be switched off completely between certain hours. With the wireless on, I measured power consumption of 5.1 watts when the 3490 was in use. In order to test the 3490 I used the Mac software WiFiPerf along with a 2013 MacBook Pro, which natively supports 3x3 802.11ac wireless. WiFiPerf is a great app for testing, since it sends data directly between the server and client, while a file transfer can be affected by the speed of a storage device. I ran the test at distances of one metre, five metres and ten metres. At five minutes I measured the speeds from client to server as well as server to client. As is becoming a trend in some modern routers, the 3490 doesn't allow you to explicitly choose 2.4GHz or 5GHz output, but instead picks the fastest bandwidth available depending on the device that connects to it. So it wasn't possible to test 2.4GHz performance on 802.11n with this setup. This isn't too much of an issue nowadays, since just about all new devices from the last few years support 5GHz 802.11n, as well as 802.11ac. For reference, I usually see around 120 Mbit/sec at close range with 2.4GHz from most routers, which is far less than you get with 5GHz, but seemingly slightly better range, since 5GHz seems to drop off far quicker. Having tested a wide range of other routers under identical conditions, I can say these results are mostly excellent, with short-range 802.11ac performance that's right up there with some of the best models on the market, and, surprisingly, a notable improvement over the results I measured from the 7490. The 3490 is fast in both 5GHz 802.11n and 802.11ac wireless modes. The software is well-designed and full of useful features. Although the latter has been always been a strong point for AVM, I've never seen really excellent wireless results from their products, so finally having performance that matches the software quality is more than welcome. And what's best is the price. AVM routers aren't cheap, and the 7490 is one of the priciest routers on the market. Although the 3490 isn't the most affordable router, it's on a level that's at least equal to many competing models and notably better value than many of AVM's other models. A few years ago, AVM's original approach to intuitive and well-designed router software was revolutionary. Now though, other firms have embraced the same philosophy and provides software that's just as good as AVM's efforts. Many of the features offered by the Fritz!Box are equalled, or in some cases surpassed by the software on other routers. 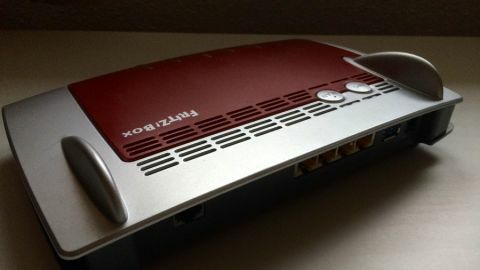 The Fritz!Box routers are just starting to look a little dated, and no longer as original as they once were. The transfer speeds are great, some of the best I've seen from AVM, but this is coming at a time when most firms are launching quad-stream models, which are faster still, leaving AVM one step behind with their mainstream offering. Expect the next AVM router to be an all-singing 4x4 model. And given the similarities of the external design with the 7490 and so many older Fritz!Box models, I now feel AVM's software and hardware could do with a more radical overhaul to make it feel fresh again.